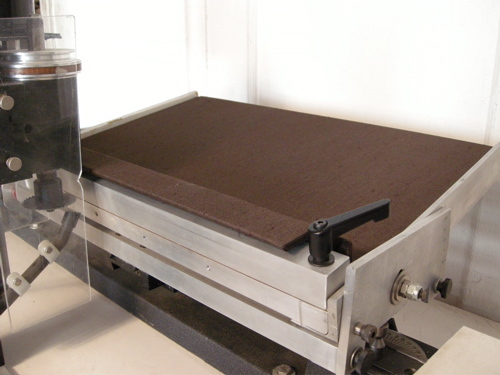 The OCC purchased a board slotting machine in 2007and it immediately became a useful addition to our studio. So far we have used the board slotter for several individual items with great effect. However, we realised from the beginning that its use was particularly relevant where there are large numbers of similarly bound volumes with similar binding problems and repair issues. Since this time we have been viewing our collections with this in mind and with the aim of establishing a large scale board slotting programme. Two collections have been identified as potential candidates for this programme. The first is the Daubeny Collection at Magdalen College and the Law Reports at Corpus Christi College. The Daubeny Collection was established by Dr. Charles Daubeny (1795-1867) who was an undergraduate at Magdalen but went on to study alongside Charles Darwin. He was the the College’s most noted 19th century scientist, specifically in Botany. This large (500+ volumes) collection is formed from his personal library. They are housed in Daubeny’s original laboratory which has recently undergone substantial refurbishment. The collection is predominantly mid nineteenth century half or quarter hollow backed bindings, most of which belong to a series of identical volumes. The collection is experiencing the predictable signs of deterioration due to the inadequacy of the original binding materials and subsequent environmental conditions. Many have one or both joints broken and missing or detached spine portions but on the whole the sewing structure is sound. Very little repair work has been completed on this collection, adding to its suitability for boardslotting. The Law Reports series at Corpus Christi College are an heavily consulted collection of periodicals dating from 1865 to the present day. As several editions were produced within a year this collection numbers many hundreds of volumes. They are bound in a variety of materials including identical light tan quarter and half leather with a hollow back and fully case bound in grey or tan buckram. The older volumes bound in leather are experiencing similar problems to the Daubeny Collection: broken joints and loose and missing spine portions. However, many volumes have been traditionally rebacked. This makes this collection particularly suitable for comparison with boardslotting in terms of longevity and speed of repair. Over the next quarter I aim to chart our progress with these two projects through the blog so you can see the trials and tribulations of a board slotting programme. It would be great to have feedback from others who have already gone through this process as a means of guidance and to provide useful pointers for the success of our programme. Likewise, our blog posts will hopefully provide information for anyone who is contemplating doing this on how to do, or indeed not to do, it!